Caught a sight of moon tonight (by chance) and came in surprise that moon looks thrice in size to its usual size. Mostly called as Blue moon. Didn't succeed in getting the details and explanations of the phenomenon on Internet. Wikipedia just tells about the origin of the word blue moon and particular dates at which super moon is more obvious but doesn't shed the light on the true physical causes. Just wondering what could be the causes that makes the appearance of moon (near the horizon) so big. 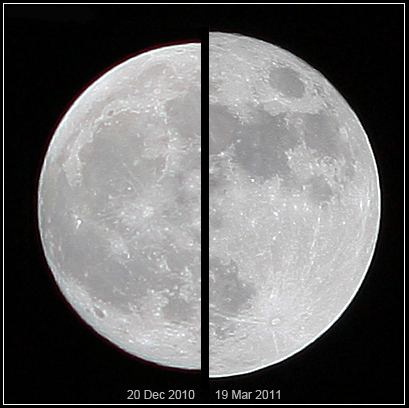 A Supermoon is when the point in the Moons orbit when it is at its closest to the Earth coincides with full or new Moon (see Wikipedia entry). A blue Moon is (in this instance) the occurrence of a second full Moon in the same calendar month (see Wikipedia entry), and is unrelated to the coincident Supermoon. The apparent giant Moon you report is the well known Moon illusion where the Moon appears larger when observed near the horizon compared to when seen higher in the sky. The Moon illusion is startling if you are unfamiliar with it and very much more noticeable than a Supermoon to the casual observer. What are these faint streaks on the moon?